They are a little older, have crew cuts and lots of tattoos, but otherwise they look like any other medical resident roaming the halls of The Montreal Children’s Hospital. The big difference is when they finish their rotation they won’t be accepting a job at a clinic or CLSC, they will be deployed to Afghanistan this spring as part of the military’s medical corps. Since the fall, the MCH has been training soldiers from CFB Borden. 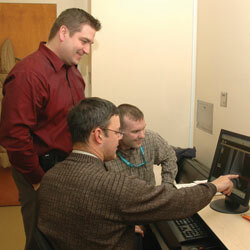 The soldiers have completed the military’s Physician Assistant Course. They are doing a five-week rotation at The MCH in internal medicine, surgery and trauma in order to brush up on their skills in advance of their deployment. Sergeants Mark McLennan and Bill Burfitt completed their five-week training at the MCH in December. They have already seen their fair share of combat. Between them they have done rotations in Rwanda, Bosnia, Kosovo and Afghanistan. Both sergeants attended the Canadian Forces medical school in B.C. The military’s school of medicine has a very distinct curriculum from, for example, McGill University or the University of Toronto. Physician Assistants can basically perform most of the work of an MD. While Quebec doesn’t recognize the role of Physician Assistant, more and more provinces, including Ontario, do recognize them, and are eagerly hiring these men and women once they leave or retire from the military. This past fall, approximately 30 members of the Canadian Armed Forces (medics, physician assistants and MDs) in Pediatric Trauma and Critical Care completed a two-week training course at the McGill Medical Simulation Centre. This involved the use of the High Fidelity Simulation Lab (using advanced patient simulators to develop critical thinking and team skills) as well as hands-on surgical skills. Various members of Pediatric General Surgery, Pediatric Emergency Medicine, Pediatric Critical Care and the Trauma Program were involved as instructors. Dr. Ken Shaw oversaw the skills workshop. Dr. Ronald Gottesman, division head of the Pediatric Intensive Care Unit, coordinated and instructed the simulation training.